My very first purchase of Peak Design gear was in 2011 when I came across its Capture Clip system on Kickstarter. I actually contacted the president of the company, Peter Dering, and asked him if I could take a prototype of the new product up a mountain I was climbing that same week. He said yes and overnighted me a prototype so I could test it out in the field. That started my long affiliation with their products. Since then, I’ve purchased quite a bit of their equipment including the Leash, Cuff, Slide, Pro Pad and newer versions of the Capture Clip system. I keep throwing money at them because I think their gear is some of the best on the market. At the 2019 WPPI expo, I met up with Lawrence Lander, Peak Design’s creative director, and asked him to show off the brand-new Travel Backpack 45L and the extremely-useful Tech Pouch. It looks like I’m going to be spending some more money with Peak Design. The pack can grow or shrink depending on your needs. Basically, you can compact everything down for a 30L capacity or expand everything for a 45L capacity. I love how the pack is designed to be used for a wide variety of purposes. You can set the bag up as a camera bag. Or, you can redesign the interior to be a hybrid of camera/clothing/laptop. Or, you can set it up to be strictly for travel/clothing. Genius. I know, it sounds crazy to talk about a large travel backpack being compact, but Peak Design has designed the bag so all the straps quickly and easily stow away. This feature makes it much easier to fit the bag in regional airliners or Ubers when on the road. Anymore when I travel, I pack all kinds of cables, memory cards, chargers, disk drives, cell phones, etc. The Tech Pouch is specifically designed to carry and organize all those things. I don’t know that I’d necessarily say it is revolutionary, but I do think it is genius. 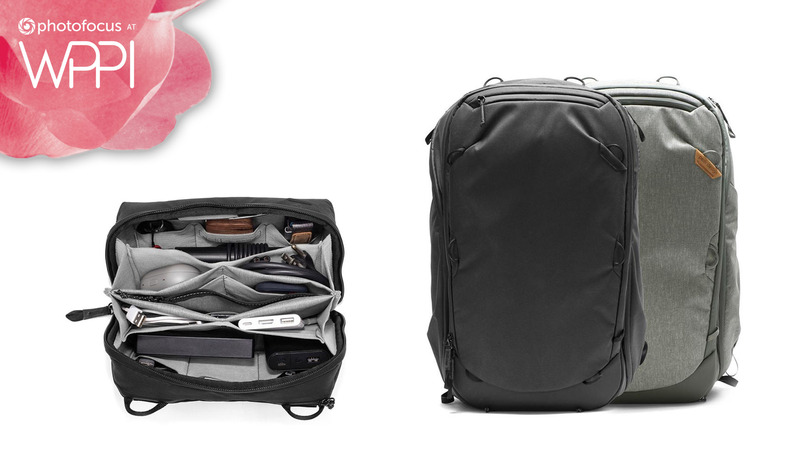 This little bag comes in at 2L capacity and has no less than 21 interior pockets. Peak Design uses an origami-inspired divider system that allows the bag to expand and contract depending on how much stuff you cram inside. Some of the pocket dividers have zippers so you can keep really small items inside without fear of losing them if the bag tips over.